This is about approaching extension as a bottom-up process to achieve change – as an exercise in human development for outcomes that have an impact at the farm, community and industry scale (Coutts et al., 2005). It uses a facilitation process to help groups of motivated participants to identify and understand their own learning needs and to assist them in fulfilling these needs. An extension practitioner becomes the facilitator providing the enabling environment for self-directed and social learning to take place amongst individuals and communities who take the initiative to define and respond to problems from their perspectives. The assumption is that the opportunity for individuals and communities to interact on a commonly understood problem or situation as a process of self-determination, will and can bring about an improvement to the situation. Do the potential participants (project team or individuals) express or endorse a need for facilitation assistance? Are the groups are self-selected? Are the facilitators selected or endorsed by the group participants? 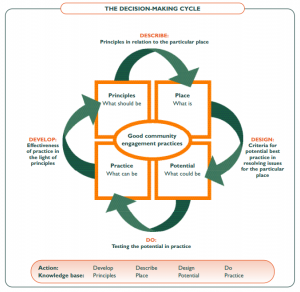 Is a planning cycle incorporated into the process, including reflection on progress? Do group members have the opportunity to receive training in group processes and planning? Do groups meet regularly and share experiences? Are boundaries for use of funder resources and reporting needs negotiated and agreed to by funders, the project team and group members? Are opportunities made for professional development of facilitators and to develop facilitator networks? Are group members encouraged to benchmark their knowledge, attitudes and practices to assist in learning about the impact of the Group Facilitation/Empowerment project-process? This example is relevant to an agricultural extension context of group extension and/or empowering the farmer in decision-making within the advisor-client relationship. The approach was developed as part of a project commissioned by the Murray-Darling Basin Commission (MDBC) in a natural resource management context at a regional/community scale. Best practice in community engagement advocates for participatory approaches that include a full range of stakeholders and their knowledge systems in order to have a real ability to shape and implement change as a bottom-up approach. This is because top-down processes in which authorities/experts adopt a directive role have typically not succeeded in bringing about community-scale change. The project objectives were to: develop principles of best practice in engagement processes, describe the range of communication methods and processes that can be used, identify impediments to the adoption of best practice engagement processes and develop performance indicators for uptake and use of best practice engagement. Community: Is usually regarded as a group of people living in a specific area; but can also mean a ‘community of interest’ where members may not live geographically near each other but share a common interest in an issue/cause in which they can develop collective responses. Community engagement: Refers to engagement processes and practices in which a wide range of people work together to achieve a shared goal guided by a commitment to a common set of values, principles and criteria i.e. an engagement structure. Community engagement can be achieved using a diverse range of techniques and tools to suit the particular situation; the engagement process supports the decision-making process needed to problem solve for a particular purpose. 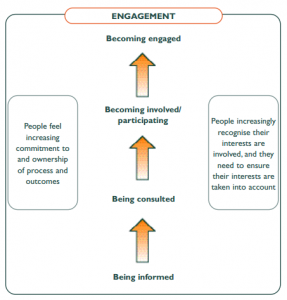 Consultation, participation, involvement: A distinction is made between consultation, participation, involvement and engagement to highlight that engagement implies the greatest commitment to the process, decisions made and resulting actions. Engagement goes further than participation and involvement and requires greater focus, time and effort. In contrast, consultation is about seeking advice from others; participation is simply the act of participating in any form and involvement is the act or process of being involved. Unless the decision-making cycle as part of action research in a learning system is fully completed, experiential learning does not fully occur and the inquiry is incomplete. In reference to applying this approach to the community engagement process, the same principle applies i.e. unless communities and individuals are engaged right around the decision-making cycle, their opportunities to contribute to outcomes and undergo learning experiences are not realised effectively. It is important to note that participants in engagement processes need to constantly adjust and compensate for people belonging to particular knowledge systems/bases that tend to often reject other knowledge traditions/bases. People may dismiss local knowledge as ‘gossip’, specialist knowledge as ‘jargon’, strategic knowledge as a pre-set ‘done deal’ and integrative knowledge as ‘impractical’. The idea is to give equal respect to each knowledge base/system. Aslin, H.J. and Brown, V.A. 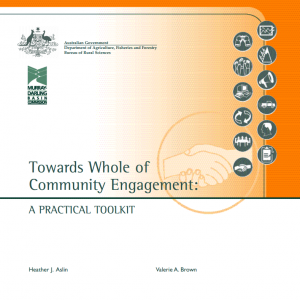 (2004) A framework and toolkit to work towards whole-of-community engagement. Many rural development projects aim to increase the empowerment of project stakeholders as part of capacity building but seldom is there a process or tools to benchmark and measure the impacts of this dimension of capacity building. The following is a guide (process and tools) aimed at capacity building practitioners, funders and evaluators to help them to be able to know how to build empowerment and measure and assess any related changes as capacity building indicators. It is based on the assumption that people could be taken through processes to develop their individual and collective capacity to learn better, make better decisions and become more self-sufficient with regards to their learning. It draws on a range of principles from the education, instructional design and management literature regarding empowerment. 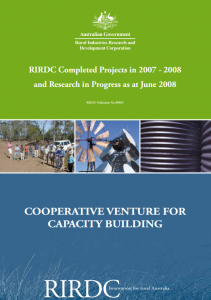 This project was funded through the Cooperative Venture for Capacity Building in Rural Industries. To download the details on the initiative click on the image below. Empowerment: People having the skills and confidence to proactively respond to issues and make the most of the opportunities available to them. Capacity Building: Externally or internally initiated processes designed to help individuals and groups associated with rural Australia to appreciate and manage their changing circumstances, with the objective of improving the stock of human, social, financial, physical and natural capital in an ethically defensible way. Communication – higher level communication is not just about communicating a message to a receiver, it is also about having the ability to resolve conflicts and negotiate win-win outcomes as part of managing the impact of communications; higher level communication relies on the messenger knowing about oneself (social intelligence that is developed from learned behaviour/emotional intelligence) which enables a person to understand other people’s thoughts, feelings and intentions, possess extensive knowledge of rules and norms in human relations, can empathize and manage their own and others emotions, adapts well to social situations and is open to new experiences, ideas and values. The relevant skill-set for communication is: The ability to communicate, listening skills, the ability to create a message, conflict management, negotiation, advocacy, be motivational and well developed self-knowledge. Community cooperation/social networks – networks connect individuals with each other at the individual and organisational level, the value of social networks can be measured in economic terms e.g. saving costs by sharing resources, the extent of ‘reach’ and diversity (the depth and breadth of a network), the contribution and implementation of innovative ideas, and the cultural change that may come from being connected to a network; a network can be measured both quantitatively and qualitatively using Social Network Analysis methods. Leadership – refers to an individual’s ability to influence, inspire, motivate, guide and direct others to achieve a common or shared goal; leadership is enhanced by the individual ‘leading by example’ and when they can empower others to act; leaders have vision, can communicate, are confident, make good decisions, empathetic and above all else, are respected; it is recognised that there are two types of leaders: those who shape an direct and those who coordinate. The presence and comprehension of these skills alone does not indicate whether empowerment is being developed and exercised, rather it is the level of mastery at which the skills are used that is the real evidence i.e. it is the ability to synthesize (modify and apply appropriately to specific situations) and evaluate the use of these skills that brings about empowerment. Once these skills are well developed a person can be considered as having the attributes of empowerment which are closely related to the characteristics of self-efficacy (e.g. faith in own capabilities, knowledge of self, commitment to truth, ability to work collaboratively and communicate openly, respect for others and the capacity to make choices and to transform those choices into desired actions and outcomes). The extent to which an individual is empowered varies with the particular context and not all skills are needed for an individual to be empowered. Becoming empowered is a process of skills development by firstly understanding what your current skill set is, choosing which skills need developing in the given context, the acquisition of skills through a learning process and being capable of demonstrating those skills as an indication of empowerment. Not everyone can be empowered in all situations but an individual can choose which situation they want to be empowered in and develop the skills needed to achieve that. 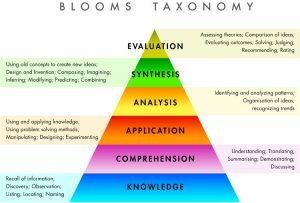 Referring to Bloom’s hierarchy of learning, the level of skill needed for empowerment is at the higher end of the continuum beyond the level of analyses and application and moves into the learning space of synthesizing and evaluating. This is because empowerment requires the individual to be able to self-assess/self-reflect about their modified application of themselves in a certain situation as a demonstration of a person’s empowerment i.e. owning and evaluating your own experience is an act of empowerment in itself.